DUBUQUE, Iowa—The Center for Business Analytics at Loras College recognized Heartland Financial USA, Inc. and Rockwell Collins, Inc. as 2017 Business Analytics Innovation Award recipients for demonstrating excellence through their use of analytics to better serve their company and customers. 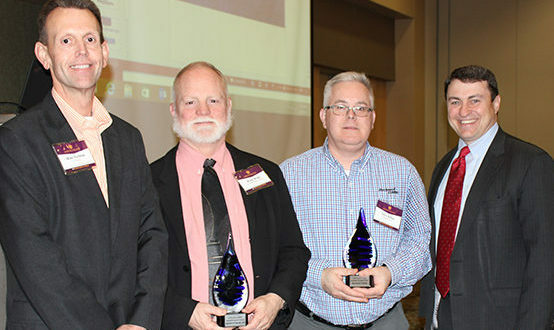 The awards, sponsored by TH Media, were presented Thursday during the 2017 Loras College Business Analytics Symposium. Winners were chosen based on a business analytics project, process or concept implemented by the company and the tangible economic, social or environmental impact it demonstrated. Rockwell Collins is a pioneer in design, production and support for aerospace and defense customers. The global business, headquartered in Cedar Rapids, operates in more than 60 locations in 27 countries, employees 19,000 people, and had more than $5.2 billion in revenues in fiscal 2016. Rockwell Collins values Lean principles and is always striving for continuous improvement. This team identified opportunities to gain additional efficiencies in manufacturing and inventory management, particularly for obsolete parts. With his big-data solution, Arthur and a global team merged information from four complex business systems with more than 40 million records from four business units and shared services. Now, in seconds, users can see their part usage exposure and projected inventory runout dates for 30 years into the future. Arthur’s solution postures the organization for even more predictable business performance and is yielding expected outcomes. Founded in 1981, Heartland Financial USA, Inc., headquartered in Dubuque, is a multibillion dollar bank holding company offering uniquely different banking solutions for business and personal clients. Heartland’s independent community banks are chartered in the states of Iowa, Illinois, Wisconsin, New Mexico, Arizona, Montana, Colorado, Minnesota, Kansas and California, with a total of 108 banking locations serving 85 communities. In 2016, Heartland Financial commissioned a cross-functional project team to enhance commercial sales and coaching by creating consistent data visualization of commercial products and sales goals. This enterprise-wide endeavor engaged business partners in Heartland executive management, commercial lending, treasury management, business analysis, process improvement, information services and business intelligence. The collaborative approach delivered a solution that standardized commercial lending metrics, freed thousands of hours annually from data management and reporting, and directly and visually linked sales activities to results.